Looking north on North Albany Road on Saturday afternoon. 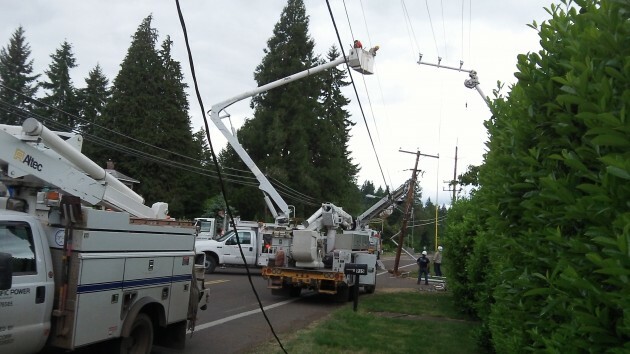 As you can see above, Pacific Power crew members worked Saturday afternoon to replace a power pole on North Albany Road. The road had been closed since Saturday morning. A worker manning the roadblock at the south end of the work zone told me that a trailer had come loose and slammed into the pole by the side of the road. The accident happened just before 8 a.m. (judging by the momentary blip in the electricity at my house). The closure due to the accident gave drivers a mandatory preview of a detour that will become necessary when that portion of North Albany Road is completely closed starting about June 12 so the city’s contractor can rebuild and widen the road and replace the bridge across Thornton Lakes. The detour takes traffic along Quarry Road between North Albany and Spring Hill. In related road news affecting North Albany, construction is scheduled to start in June on a sidewalk along Gibson Hill Road from the roundabout to Scenic Drive. Emerson & Sons of Salem, which has the nearly $6.6 million city contract for North Albany Road, also was the low bidder (among five) for the ODOT contract on Gibson Hill at about $864,100. Staci Belcastro of Albany Public Works says work is anticipated to start June 15, but some jobs like setting up erosion control will be done before.